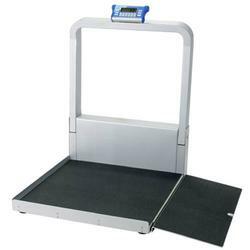 The ultimate in versatility and portability, the heavy-duty Model DS9100 Wheelchair Scale can serve as a wheelchair scale as well as a handrail or stand-on scale. To transport, the DS9100 folds and rolls effortlessly on four casters. The ultimate in versatility and portability, the heavy-duty Model DS9100 Wheelchair Scale can serve as a wheelchair scale as well as a handrail or stand-on scale. To transport, the DS9100 folds and rolls effortlessly on four casters. Once in place, the DS9100 easily unfolds with built-in hydraulic assistance, and two latches hold the indicator mast firmly in place. The large, low-profile platform accommodates bariatric wheelchairs. The DS9100 features a tare memory function that can store and recall the weights of up to ten different wheelchairs. This eliminates error prone hand calculations to determine the patient’s weight. In addition, you can simply enter the known tare weight of the wheelchair through the numeric keypad. To acquire a patient’s weight, less the wheelchair tare weight, roll the patient onto the DS9100 platform, recall the wheelchair tare weight and an accurate weight up to 1,000 pounds will be held on the display. Tare entry can be accomplished before or after the patient is on the scale. Our exclusive Weight Lock feature allows an accurate weight to be held regardless of a patient’s motion. The Reweigh feature allows a second weight to be acquired while the patient remains on the platform. Last Weight allows the previous weight and BMI value to be recalled after the patient has left the platform for later recording. To calculate BMI, enter the patient’s height using the numeric keypad, press the BMI button and the patient’s Body Mass Index is instantly displayed.